Have you ever been encouraged to heal your “father wounds” so you could receive the love of your heavenly father? I have. More than once. The first time it happened I was a high school sophomore, and I remember thinking, (a) Is my here-on-earth father really some gatekeeper for my relationship with God? and (b) Is my relationship with my mother really so inconsequential to my faith? 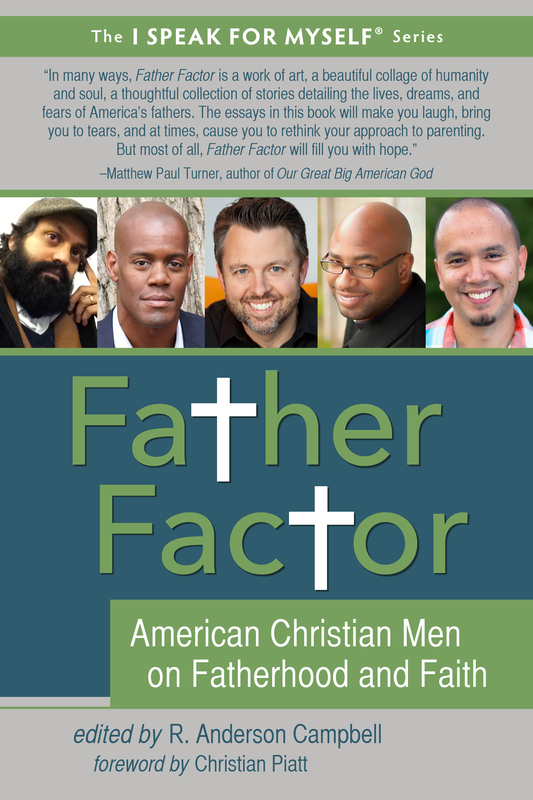 In Father Factor: American Christian Men on Fatherhood and Faith (White Cloud Press, Oct 2014), author and editor Anderson Campbell aims to liberates people from a narrow understanding of what we mean when we say God is father and proposes that parents and non-parents alike, men and not-men too, can teach us something about this heavenly title. Father Factor is the latest anthology in the I Speak for Myself series (of which Talking Taboo is a part) and is comprised of forty personal essays from Christian men under 40 exploring the affirming and unsettling connections. I admitted to Anderson in our 15-minute interview that a book on fatherhood and faith made me a little, well, nervous. “This idea of God as Father, that particular metaphor or way of framing our understanding of God is one that we inherit, and it’s one that carries a lot of baggage,” he admits. “I was hoping that the book would be able to shed some of that baggage, and we would have some new ways of reframing or recapturing better that idea of God.” Essays from Lawrence Garcia (“God the Father is Like Jesus the Christ”) and Brian Bantum (“To Be a Father Like My Mother”) assured me the book wasn’t reinforcing the notion of biological fathers as more God-like. Ultimately, Anderson says, he hopes we’ll let God the Father shape our notion of what it means to be human. *For more reflection on how God the Father shouldn’t be conflated with human masculinity, I recommend Janet Soskice’s The Kindness of God: Metaphor, Gender, and Religious Language. As Christian Piatt notes in the foreword, this is a bewildering time for the post-modern father. Father Factor doesn’t just seek to unpack our father baggage but assemble a new, more holistic and hopeful, way to carry the image of a God called Abba. Like you, I was both excited and nervous about this book, but I’m really looking forward to this now. Nice to have the vision clarified.